The need to integrate information from multiple linkage maps is a long-standing problem in genetics. One way to visualize the complex ordinal relationships is with a directed graph, where each vertex in the graph is a bin of markers. When there are no ordering conflicts between the linkage maps, the result is a directed acyclic graph, or DAG, which can then be linearized to produce a consensus map. New algorithms for the simplification and linearization of consensus graphs have been implemented as a package for the R computing environment called DAGGER. The simplified consensus graphs produced by DAGGER exactly capture the ordinal relationships present in a series of linkage maps. Using either linear or quadratic programming, DAGGER generates a consensus map with minimum error relative to the linkage maps while remaining ordinally consistent with them. Both linearization methods produce consensus maps that are compressed relative to the mean of the linkage maps. After rescaling, however, the consensus maps had higher accuracy (and higher marker density) than the individual linkage maps in genetic simulations. When applied to four barley linkage maps genotyped at nearly 3000 SNP markers, DAGGER produced a consensus map with improved fine structure compared to the existing barley consensus SNP map. The root-mean-squared error between the linkage maps and the DAGGER map was 0.82 cM per marker interval compared to 2.28 cM for the existing consensus map. Examination of the barley hardness locus at the 5HS telomere, for which there is a physical map, confirmed that the DAGGER output was more accurate for fine structure analysis. The R package DAGGER is an effective, freely available resource for integrating the information from a set of consistent linkage maps. The need to integrate information from multiple linkage maps into a consensus map is a long-standing problem in genetics [1, 2]. Consensus maps have been developed for many crops, including wheat , sorghum , and potato . Within the barley research community alone, at least seven consensus maps have been published in the past six years [6–12]. Wenzl et al. differentiated between two broad strategies for constructing consensus maps. In the traditional approach, the consensus map is determined directly from the genotypic data, using extensions of the maximum-likelihood methods developed for single populations . While this approach was effective for many years, it has not always produced consistent and timely results as marker densities have continued to increase [7, 14]. These limitations have spurred innovation in a second ("synthetic" ) strategy, in which the consensus map is generated from the linkage maps without recourse to the original genotypic data. It was Yap et al. who first recognized that the complex ordinal relationships present in a series of linkage maps can be exactly represented as a directed graph (Figure 1). Each graph represents a single chromosome and each vertex in the graph represents a bin of markers. Provided there are no ordering conflicts between the linkage maps, the ordinal relationships in the directed graph are equivalent to those in the linkage maps. In other words, there is a path from vertex v to vertex w in the graph if and only if bin v comes before bin w in one of the linkage maps. Diagram of the DAGGER package. Linkage maps are first converted into unbranched directed graphs, where each vertex is a marker bin and each edge length is the distance of the corresponding map interval. After merging the linkage maps, the consensus graph is checked for cycles, which represent ordering conflicts. Provided there are none, the consensus graph can be simplified to generate an ordinal consensus graph, which contains only those edges needed for ordinal equivalency with the linkage maps. The consensus graph can also be linearized to produce a consensus map, using either linear or quadratic programming (latter is shown). Wu et al. have capitalized on this graph-theoretic formulation in their software MergeMap , a free resource for constructing consensus maps. MergeMap contains an efficient algorithm for resolving ordering conflicts between linkage maps, which appear as cycles in the consensus graph. The removal of these cycles produces a directed acyclic graph, or DAG, which MergeMap then simplifies and linearizes to produce a consensus map. Close et al. used MergeMap to integrate four barley linkage maps genotyped at nearly 3000 SNP markers. The resulting consensus SNP map has been used for association mapping [17–19] by members of the Barley Coordinated Agriculture Project (Barley CAP) . In addition to the consensus map, Close et al. published consensus graphs for each of the seven barley chromosomes. While examining the fine structure of the hardness locus on the 5HS telomere, which has been sequenced , several unphysical orderings were detected in the consensus graph that are not present in any of the linkage maps. The discovery that the simplified consensus graphs produced by MergeMap are not ordinally equivalent to the linkage maps prompted the development of new algorithms for the simplification and linearization of consensus graphs. These algorithms have been implemented as a package for the R computing environment  called DAGGER . To validate DAGGER, a new barley consensus SNP map was constructed and compared with the results of Close et al. . The performance of DAGGER was also evaluated with simulated data. 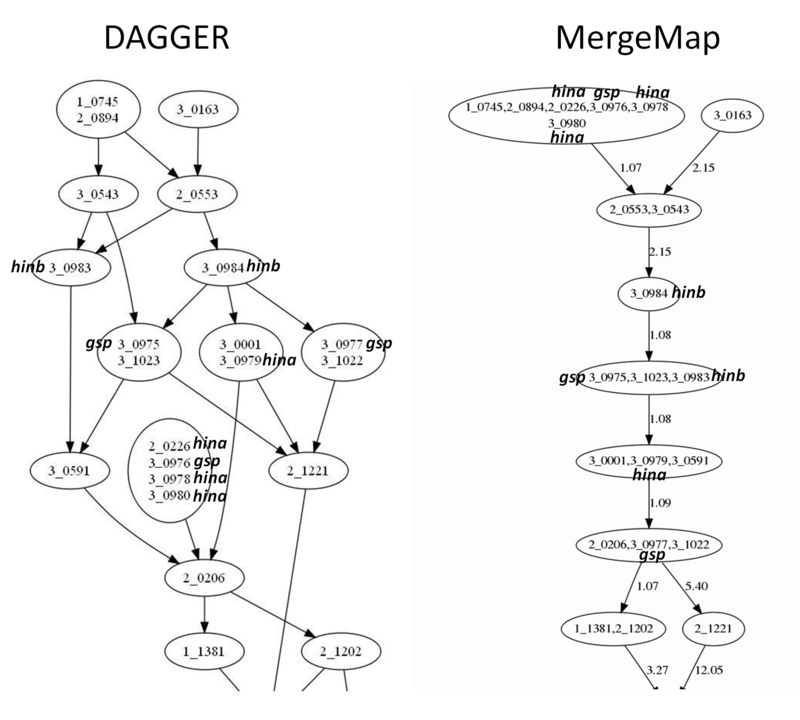 Given a list of linkage maps, DAGGER builds up the consensus graph sequentially. The first two linkage maps are merged to create a consensus graph, which is then merged with the next linkage map, and so on. The merging algorithm proceeds from the first to the last bin in the linkage map M that is to be integrated with graph G. Let S v be the set of vertices in G that contain one or more markers in bin v of M. For each vertex w in S v , if all of the markers in w are contained in v, then w remains intact. If only some of the markers in w are in v, then w is split into two vertices: w1 contains the common markers between v and w, and w2 contains the remaining markers in w. All of the edges directed in and out of w are replicated for w1 and w2. Vertex w1 also receives new edges directed in and out of it according to the immediately proximal and distal bins in M. Any markers in v that were not present in G are added as a new vertex with appropriate edges. When completed, the consensus graph contains a directed edge for every map interval between adjacent bins in the linkage maps (Figure 1). During construction of the consensus graph, DAGGER also keeps track of which markers were binned in the linkage maps. The map distance between binned markers is zero, and this information is needed to minimize the error between the consensus map and linkage maps (see below). Although depicted in the consensus graph (Figure 1), the zero-length edges are not part of its topology (i.e., they do not imply ordinal relationships). DAGGER checks for ordering conflicts between the linkage maps by identifying the strongly connected components of the consensus graph. Two vertices v and w are strongly connected if there is a path from v to w and from w to v. In the context of markers, that would mean the markers in v mapped before those in w, which in turn mapped before those in v; this represents an inconsistency between the linkage maps. Identifying the strongly connected components of a directed graph is a standard exercise in computer science . DAGGER performs two depth-first searches, one on the reverse graph G R (formed by reversing the edges in G), and then on G itself. The traversal of G R generates a topologically sorted list of the vertices. By conducting the depth-first search of G in this order, the algorithm identifies the strongly connected components of G.
DAGGER will only proceed with graph simplification and linearization if the marker order between linkage maps is consistent. To facilitate manual curation of errors in the linkage maps, DAGGER will output the strongly connected components of G for visualization with the Graphviz dot software . When the inconsistency is due to a small misplacement, this visual will indicate where to look in the genotypic data to resolve the ordering conflict. For more complex and long-distance inconsistencies, the conflict-resolution algorithm in MergeMap  is a valuable resource. In the absence of ordering conflicts, DAGGER will output the consensus graph for visualization in one of two forms. The first option is to display the graph with all of the distance information used to generate the consensus map. The second option is to simplify the graph so that it conveys the ordering of the markers but not their distances, which potentially allows many edges to be removed (Figure 1). The ordinal consensus graph produced by DAGGER contains only those edges that are needed to satisfy the equivalency property stated in the introduction, namely, that there exists a path from vertex v to vertex w if and only if bin v mapped before bin w in one of the linkage maps. The edge reduction proceeds by first using the topologically sorted vertex list from the depth-first search of G R to determine, for each vertex v, the list of all vertices reachable from v. Next, the edges for each vertex are considered for elimination according to the topological sort order of the vertices to which they are directed. Let Q be a topologically sorted list of the vertices to which there are directed edges from vertex v. If vertex Q k is reachable from vertex Q j with j < k, then the edge to Q k is removed. Following the edge reduction, DAGGER performs one other simplification without loss of ordinal information. Some of the marker bins that were split during the construction of the consensus graph, due to different distance estimates, may have the same pattern of inward and outward edges after the edge reduction. These vertices are combined and their markers put back in one bin. Whereas the ordinal consensus graph produced by DAGGER will not be invalidated by further research (provided the component linkage maps are correct), this is not true of the marker order in the consensus map. Because recombination distances are population-dependent, the relative order of markers that have not been mapped together in a single population cannot always be determined unambiguously. where x(m1) and x(m2) are the positions of markers m1 and m2 in the consensus map x, and d k (m1,m2) ≥ 0 is a distance interval from the kth linkage map. When the exponent α = 1, DAGGER minimizes the L1 norm; when α = 2, the L2 norm is minimized. The outer sum in Equation 1 is over the linkage maps, and the inner sum is over all pairs of markers (m1,m2) in either the same or adjacent bins in the kth linkage map. Analogous to Equation 1, x(v) and x(w) are the positions of marker bins v and w in the consensus map (every vertex in the consensus graph becomes a bin in the consensus map), and d(v, w) ≥ 0 is an edge length. For Equation 1 to equal Equation 2, the weighting factor q v,w = (# markers in v) × (# markers in w). To test the performance of DAGGER, it was applied to simulated linkage maps generated from 1000 evenly spaced markers with a total map length of 100 cM. The results in Table 1 are for random parents with an average sequence identity of 70%, for which the expected number of markers per linkage map is 0.3 × 1000 = 300. Using more divergent parents led to maps with more markers, but the trends were the same. The mean (and SE) are reported for 100 simulations of a 100 cM interval containing 1000 markers. Linkage maps were generated from doubled haploid populations of 200 offspring, using parents with 70% sequence identity. Results are shown for both the LP and QP methods of linearizing the consensus graph (error was calculated after rescaling). The simulated data illustrate the primary benefit of integrating multiple linkage maps, which is that higher marker densities are possible. Table 1 shows that the average number of markers in each linkage map was indistinguishable from the expected value of 300. Consensus maps based on two linkage maps contained an average of 514 markers, and with eight linkage maps an average marker density of 944 out of 1000 was achieved. An unusual feature of both the LP and QP linearization methods is their tendency to compress map intervals, whereas most consensus maps are inflated relative to the original linkage maps (e.g., [7, 11]). As shown in Table 1, the amount of compression increased as more linkage maps were integrated. For two linkage maps, the LP and QP consensus maps were compressed by 17% and 12% respectively, while for eight linkage maps the compression was 44% (LP) and 38% (QP). The QP consensus maps had consistently less compression than the LP maps. For the simple example shown in Figure 1, where both linkage maps have a total length of 3.0 cM, one can verify analytically that the QP consensus map is compressed to 2.8 cM (the LP map is 2.5 cM). By default DAGGER rescales the consensus map so that its total length equals the mean length of the component linkage maps, but the user can also request the compressed map. Table 1 shows that, in addition to increasing marker density, integrating more linkage maps tends to reduce the error between the consensus map and the simulated physical map. This was true regardless of whether error was measured with the L1 norm (mean absolute error) or L2 norm (root-mean-squared [RMS] error). With only one linkage map the average RMS error was 4.7 (SE 0.2) cM, while with eight linkage maps the average RMS error was 2.4 (SE 0.1) cM for the QP method. Using either norm, the QP maps had consistently less error than the LP maps (contrast: RMSEQP - RMSELP = -0.3 cM < 0, p < 10-4). The original impetus for developing DAGGER came from analyzing the results of Close et al. , who used MergeMap  to integrate the information from four barley linkage maps genotyped at nearly 3000 SNP markers. These same linkage maps were used as input for DAGGER, and no ordering conflicts were detected. The ordinal consensus graphs for the seven barley chromosomes (Figures S1-S7, Additional Files 1, 2, 3, 4, 5, 6, and 7) and the QP consensus map (Table S1, Additional File 8) produced by DAGGER are available online. Figure 2 compares the ordinal consensus graph from DAGGER and the simplified consensus graph from MergeMap at the 5HS telomere. The four linkage maps for this region are reproduced in Table 2. Nine of the markers are for genes at the barley hardness locus, for which there is a physical map . The physical order of these genes is hinb/hina/gsp from the distal end. Simplified consensus graphs of the barley 5HS telomere. Marker labels are shown within each vertex, and markers for genes at the hardness locus are indicated (hinb/hina/gsp). On the left side of the figure is the ordinal consensus graph produced by DAGGER, in which there is a path from vertex v to vertex w if and only if v mapped before w in one of the linkage maps. On the right side is the simplified consensus graph produced by MergeMap. Comparison with Table 2, which contains the linkage maps for the 5HS telomere, confirms that the output from DAGGER is ordinally equivalent to the linkage maps, while the output from MergeMap is not. In particular, the simplified graph from MergeMap contains several unphysical relationships for the hardness locus markers. Abbreviations are SM = Steptoe × Morex, OWB = Oregon Wolfe Barley, MB = Morex × Barke, HO = Haruno Nijo × OUH602. Blank entries indicate the marker was not mapped in that population. None of the ordinal information in the DAGGER graph violates this physical order. The only relationships among the hinb/hina/gsp markers in the DAGGER graph are that marker 3_0984(hinb) is distal to markers 3_0975(gsp), 3_0979(hina), and 3_0977(gsp). Table 2 shows that this information comes from the Oregon Wolfe Barley (OWB) linkage map, and that no other ordinal information for the hardness locus markers is present in the linkage maps. MergeMap also captures this ordering, but in addition there are numerous relationships that are not present in the linkage maps. This is apparent from the unphysical ordering of the hinb/hina/gsp markers. MergeMap shows the markers 3_0976(gsp), 3_0978(hina), 3_0980(hina), and 2_0226(hina) as mapping distal to both hinb markers, and the marker 3_0975(gsp) is shown distal to 3_0979(hina). The order of these markers is indeterminate from the linkage maps, which is how they are portrayed by DAGGER. The unphysical relationships in the simplified graph from MergeMap arise because of the way markers are binned. MergeMap will potentially bin markers if they are binned in at least one of the linkage maps and if their order is indeterminate . To appreciate the consequences of this rule, consider the vertex with six markers at the top of the MergeMap graph. Four of these markers are from the hardness locus and were only present in the Steptoe-Morex (SM) map: 3_0976(gsp), 3_0978(hina), 3_0980(hina), and 2_0226(hina). The other two markers in the vertex--1_0745 and 2_0894--are binned with the hardness locus markers in the SM linkage map (see Table 2). The markers 1_0745 and 2_0894 were also co-segregating in the Morex-Barke (MB) population, where they mapped distal to the hinb marker 3_0983. Because the aforementioned hina and gsp markers were binned with 1_0745 and 2_0894 in the SM linkage map, and because their relationship to 3_0983(hinb) is indeterminate from the linkage maps, MergeMap binned all six markers together. This creates the implication that the hina and gsp markers are distal to 3_0983(hinb), which is consistent with the linkage maps but not implied by them (and known to be false from the physical map ). As this example illustrates, the simplified graphs from MergeMap are not ordinally equivalent to the linkage maps and will potentially contain unphysical relationships even if the linkage maps do not. The simplified graphs from DAGGER are ordinally equivalent to the linkage maps and will not contain unphysical relationships provided the linkage maps are physically correct. Table 3 shows the number of markers, number of marker bins, and amount of compression in the DAGGER consensus map (using the QP method). Because DAGGER linearizes the unsimplified consensus graph, whereas MergeMap linearizes a simplified graph, the consensus map from DAGGER had twice the number of marker bins (1886 vs. 942). Over the entire genome the DAGGER map was compressed by 13%, while the consensus map from MergeMap was inflated by 46%. The average correlation coefficient between the two maps was 0.95 on a scale of 10 cM, indicating a high degree of similarity. The DAGGER map was generated with the QP method. Nonetheless, there were several indications of improved fine structure with DAGGER. Figure 3 compares the two (rescaled) consensus maps at the 5HS telomere. On the physical map the hardness locus (hinb to gsp) is 110 kb, within which there was only 1 recombinant out of the 278 total individuals in the SM, OWB, and MB populations . This is reflected in the linkage maps in Table 2, where all the hardness locus markers appear in one bin in both the SM and MB linkage maps and in two bins separated by 1.1 cM in the OWB linkage map. From these data the hardness locus should occupy less than 1 cM in the consensus map, which was true with DAGGER (0.8 cM interval) but not with MergeMap (4.2 cM interval). Figure 4 shows the RMS error between the consensus map and the linkage maps for each of the seven barley chromosomes. 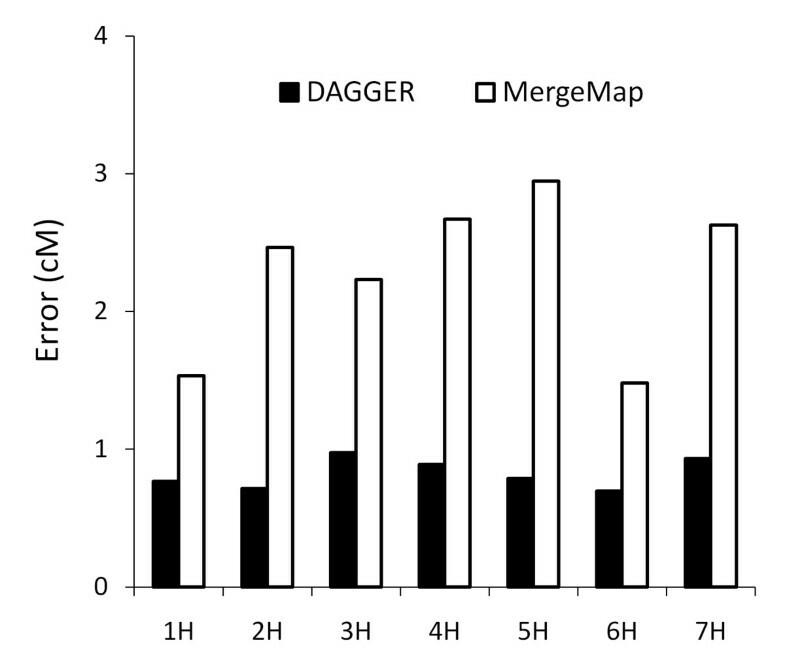 The DAGGER map had consistently less error, with an average of 0.82 cM per marker interval compared to 2.28 cM with MergeMap. Consensus maps of the barley 5HS telomere. The rescaled consensus maps from DAGGER and MergeMap (distances in cM) are shown alongside a physical map of the hardness locus. The scale of the physical map relative to the consensus maps is arbitrary; the scale bar refers only to the physical map. The consensus map produced by DAGGER is generated by linearizing an unsimplified consensus graph that is equivalent to the linkage maps. 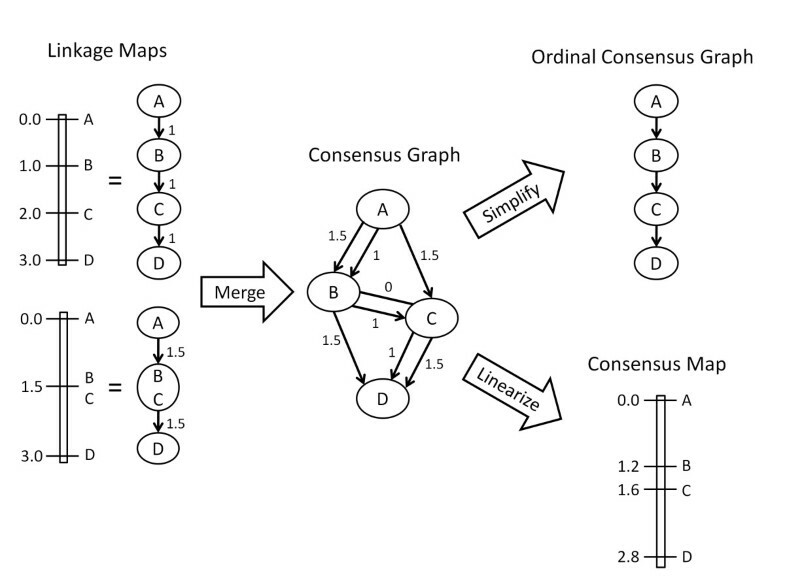 By contrast, the consensus map produced by MergeMap is generated by linearizing a simplified consensus graph that is consistent with but not equivalent to the linkage maps. Based on the linkage maps in Table 2, the hardness locus should be less than 1 cM in length; this is true in the DAGGER map but not the consensus map from MergeMap. RMS error between the consensus map and barley linkage maps. The SNP consensus map from DAGGER had consistently less error than the consensus map from MergeMap. When averaged over the seven chromosomes, the RMS error (square root of normalized Equation 1) was 0.82 cM per marker interval with DAGGER compared to 2.28 cM with MergeMap. New algorithms for the simplification and linearization of consensus graphs have been implemented as a package for the R computing environment called DAGGER. The package offers both linear and quadratic programming options for linearizing the consensus graph. When these two methods were compared using simulated data, the consensus maps generated by quadratic programming had less compression and higher accuracy. When applied to four barley linkage maps genotyped at nearly 3000 SNP markers, in less than one minute DAGGER produced a consensus map with improved fine structure compared to the existing barley consensus SNP map. The RMS error between the linkage maps and the DAGGER map was 0.82 cM per marker interval compared to 2.28 cM for the existing consensus map. Examination of the barley hardness locus at the 5HS telomere confirmed that the DAGGER output was more accurate for fine structure analysis. DAGGER is an effective, freely available resource for integrating the information from a set of consistent linkage maps. To simulate g linkage maps, 2g parents with a fixed average level of sequence identity were randomly generated and paired to create g doubled haploid populations. For each population, gamete formation was simulated for 200 individuals assuming no crossover interference. Linkage maps were constructed using Haldane's mapping function and a LOD-score weighted-least-squares approach [2, 29]. The additional constraint of fixed marker order (equal to the simulated physical order) was used to create linkage maps with no ordering conflicts. The results in this manuscript are based on four-locus linkage maps; changing to three or five loci had little effect. Statistical analysis was conducted using PROC MIXED in SAS 9.2 (SAS Institute, Cary, NC), with each simulation as "subject" to properly model the covariance structure (LP and QP consensus maps were generated for each simulation). When the four linkage maps published by Close et al. were used as input for DAGGER, no ordering conflicts were detected. Markers from unassigned linkage groups were not included, which led to three fewer markers (3_0024, 3_0764, 2_1056) in the consensus map of chromosome 4H compared with the results of Close et al. . The DAGGER consensus map for each chromosome took several seconds to generate on a laptop computer running R 2.12.1 . Following the procedure of Close et al. , the consensus maps were rescaled (by chromosome) to equal the mean length of the four linkage maps. Comparisons were made to both the published results of Close et al. as well as de novo results generated by submitting the four linkage maps to MergeMap Online  on 23 Feb. 2011 (followed by rescaling). The comparisons were nearly identical, e.g., the RMS error for the map of Close et al. was 2.23 cM vs. 2.28 cM for the de novo MergeMap output. The results in this manuscript are for the de novo MergeMap output. The physical map in Figure 3 is based on GenBank accession number AH014393.1. The positions of the SNP markers on the physical map were determined using BLAST 2 Sequences , with the query sequences taken from Close et al. . The consensus map illustrations in Figure 3 were created using MapChart . The author gratefully acknowledges the mentoring of Patrick Hayes, Stephen Jones, and Steven Ullrich.